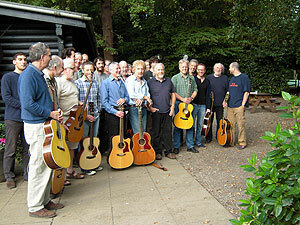 The current format of Renbourn Guitar Workshops is very much based on the way John liked them. Relaxed and easy-going but providing the student with a mass of inspiration and direction for developing their playimg. We reckon that the events so far have confirmed that we are on the right track and providing suport for fingerstyle guitarists who aspire to play the "Renbourn way". 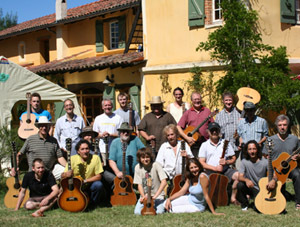 The inaugural RGW workshop in Summer 2010 was held at Le Payrare in Southern France. 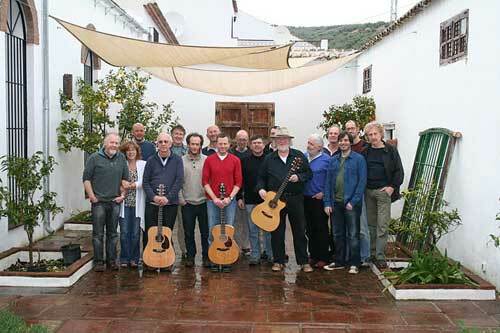 The Spring 2011 workshop was held at the Cortijo Andalus, in Andalucia, Spain. 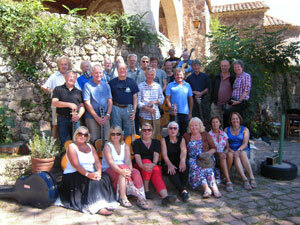 The Spring 2012 workshop saw us return to the the Cortijo Andalus, in Andalucia, Spain. 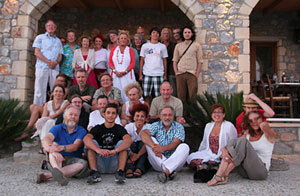 The Summer 2012 workshop was held in Southern Crete at the Pegasus Resort in Agia Paraskevi. 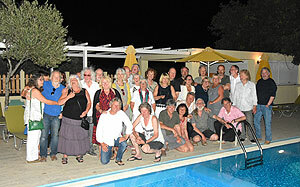 Spring 2013 workshop saw us back in Southern Crete - this time in the beautiful little resort of Agia Galini. January 2014 workshop was our first in the UK - it was held at Gilwell Park in Essex. 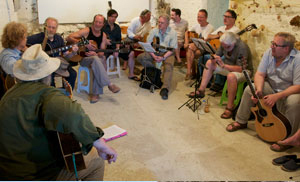 The Autumn 2014 workshop was a special event to celebrate the life and music of Bert Jansch. Gilwell Park was again the venue for this one. 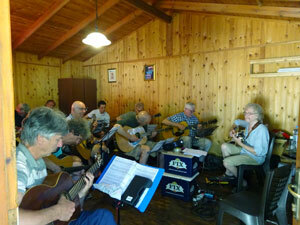 This was to be John's last workshop and was probably his favourite - he had been so keen to feature Bert's music. 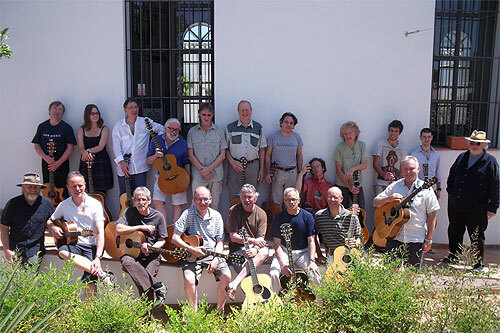 Of course we thought this was the end of Renbourn Guitar Workshops but thanks to the support of the many friends we have made and of course John';s family we resolved to carry on. The Autumn 2015 workshop was held at the beautiful Rectory of La Miana in the foothills of the Pyrenees in Spain. This venue had John's name all over it right down to a chapel to record in. Again his presence was fgelt by all. The Spring 2016 workshop saw us on familiar ground in Crete with another epic Agia Galini event with Wizz Jones once more in attendance. 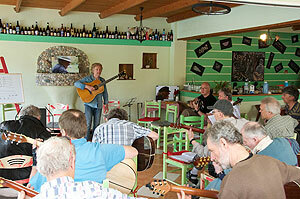 The Summer 2017 workshop in Agia Galini Crete saw us secure the services of internationally renowned guitarist. 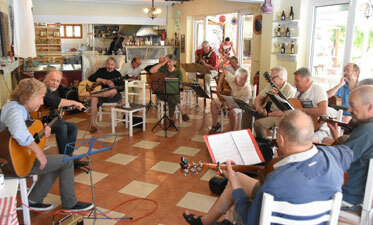 Clive Carroll for 2 unforgettable days tuition and a memorable closing concert. The Summer 2018 workshop saw another Cretan event at the Kipos which is fast becoming the workshop HQ. Wizz Jones was back (by popular demand) and Clive Carroll joined us for the last 2 days. The Friday night concert was epic.